Another metamorphosis with Susan at Between Naps on the Porch! I am inspired to get out and start digging now! After being reminded that work now will really pay off later! Going with the no-bake stuff today! 1. Mix crumbs and butter; press into bottom of 9×13 pan. 3. Beat pudding mixes and milk until well blended. 4. Fold in ice-cream and Cool Whip. 6. Sprinkle with crushed Heath bars. 8. Thaw about 20 minutes before cutting. The Crepe Myrtle is one of my favorite trees/bushes. When everything else in the garden starts looking a little tired in the hot days of summer, the Crepe Myrtle still shines bright. 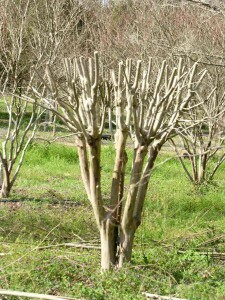 I am writing this post in an attempt to “stop the abuse.” If you want a short Crepe Myrtle, buy the dwarf variety. The natural form of the Crepe Myrtle is a lovely bottle shape that makes a wonderful addition to the landscape. Hope you are enjoying your Saturday – and feeling PINK! Heat small skillet over medium heat. Add olive oil. When oil is hot add garlic and saute 30 seconds. Stir in lemon juice, salt, pepper and bring to boil. Set aside. Arrange chicken in single layer in a lightly buttered shallow baking dish. Pour lemon garlic mixture over chicken. Sprinkle with lemon peel. Cover with foil. Bake at 400 degrees for 15 minutes. Remove foil and bake additional 10-15 minutes or until chicken is cooked through. Transfer chicken to individual dinner plates and keep warm. Pour liquid from baking dish into small skillet. Add chicken broth and bring to boil. Cook until reduced by half. Whisk in butter. Pour sauce over chicken and serve immediately. 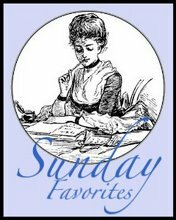 Join Chari at Happy to Design for Sunday favorites and Charlotte and Ginger at Blogger Spirit for Spiritual Sunday and enjoy your Sunday. I really used to dread January. After all of the color and celebration of the Christmas holidays, January just seemed so dull. What changed my mind about January was gardening! Yes, gardening in January. 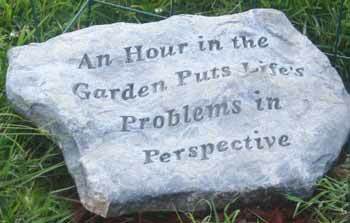 When I finally got around to enjoying gardening, I was in my late 30’s. As with most things, I got into it full force. I went from reading gardening books to going through Master Gardening training and then was an active Master Gardener for three years. Two months after Master Gardener graduation, I was chairing the Master Gardener booth at our local home and garden show. See, I tend not to do things half-way. Some would say I go a little overboard! Anyway, back to January. Now January is the time to peruse garden catalogs and start sorting through seeds to see when to start those little seedlings that will eventually go out in the garden. I now notice the silhouette of trees in the late evening winter light – lifting their arms to God! In the South, we even have some flowers that will bless us with their lovely blooms in the winter. 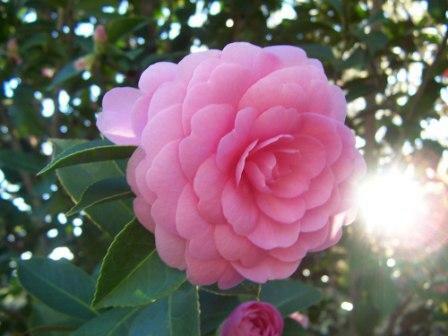 One of my favorites, which also happens to be the state flower of Alabama is the beautiful Camillia. It comes in many colors but I like this pink one for Pink Saturday. 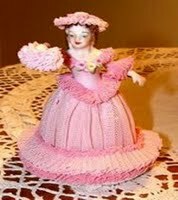 Click for Pink Saturday with Beverly at How Sweet the Sound. Another winter bloomer is the Lenten Rose (sometimes called the Christmas Rose). And one more that I love is Daphne – fragrant and pretty and early-blooming. None of these will be blooming here in my part of the South in January, but I still love thinking about them and knowing they will be here soon. I hope your January will be a wonderful one. 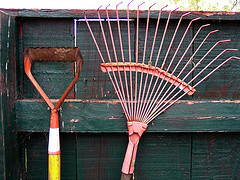 If you are a fellow gardener – Happy Planning! This is a good time of year for grapefruit and here is a wonderful way to enjoy it. 5 oz of fresh spinach. Stem and rinse the spinach. Spin or gently pat it dry. 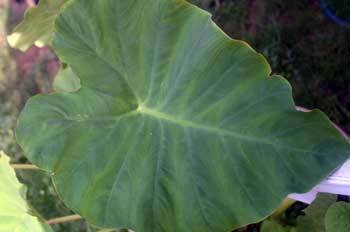 Tear the large leaves into smaller pieces but keep the small leaves whole. In a bowl, mix together the olive oil and minced garlic. Add the spinach and toss well. Set aside. Peel, seed, and section the grapefruit. Halve the avocado, remove the pit, peel, and cut into 1-inch slices. In a small bowl, combine the grapefruit and avocado. Add them to the bowl with the spinach. Sprinkle with salt and pepper to taste, then gently toss. 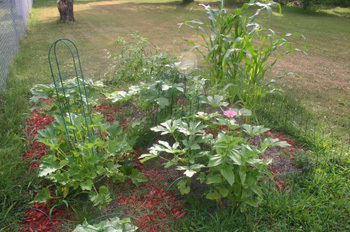 I showed you some pictures earlier this week of how my garden has grown. 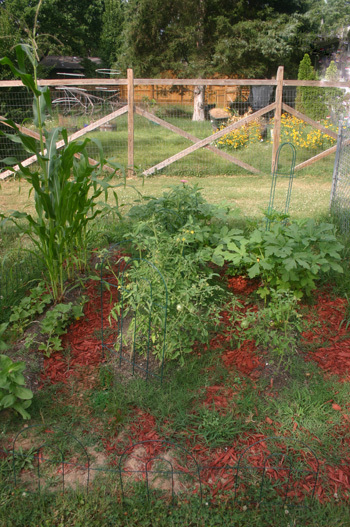 Here is my garden now – a little closer look. These are just a few close up scenes from my garden. It is Outdoor Wednesday with A Southern Daydreamer. Thinly slice tomatoes and spread out on papers towels. Salt them liberally and let them sit for about 15 minutes. Place pie crust in 10-inch tart pan and poke holes with a fork. Bake the pie crust for 12 minutes at 400 degrees or until lightly brown. Remove the crust from the oven and cover the bottom of the crust with mozzarella slices. Distribute basil leaves evenly over cheese. Cover with tomato slices. 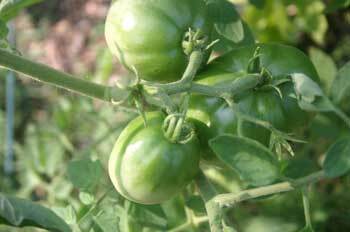 Sprinkle freshly ground black pepper over the tomatoes. Drizzle with olive oil and bake 30 to 40 minutes at 400 degrees. Let the pie rest about 30 minutes before slicing. It is best at room temperature. I have also made this on a pizza pan and just used thinner slices of cheese. 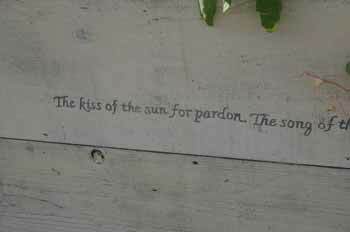 Several years ago, I built this herb planter. It originally resided on a side porch. Now it is in my yard. The thyme that is hanging over and the thyme in the left corner have been there for about five years. The rosemary really struggled this past winter with the ice storms. It has come back a little bit, but I boosted it with a new planting this year. I have nasturtiums, cat mint, chives, oregano, and basil. I’ve thrown a few seeds for dill and parsley around as well. This little guy holding the wind chimes . . .
used to be a part of this rowdy little group, playing tug of war. 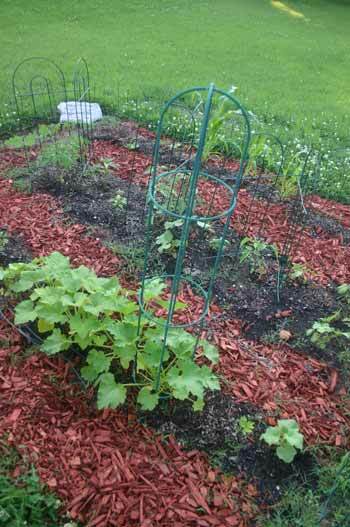 I also have some herbs planted among the other plants in the vegetable garden. 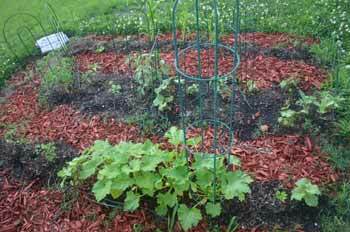 This is the first year that I have planted my entire vegetable garden from seed. It has been a learning experience. I think, I should have started sooner. At this time of year, I normally would already be harvesting veggies. This year, I’m a little behind normal. 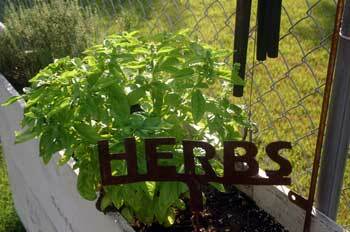 Hope you have enjoyed the tour of my little herb garden and the glance at the veggie garden. 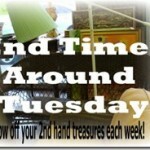 Click the pics above for more 2nd Time Around and 3 or More Tuesday posts. Quick, easy and no baking! (Unless you want to bake your own angel food cake). Slice cake horizontally. Mix Cool Whip, dried pudding mix and drained pineapple together with mixer on low speed. Fill between layers and ice cake with it. Top with strawberries or raspberries. The Southern Garden is In! Finally done! The rain finally stopped long enough for me to finish getting my garden in. It isn’t a really big garden but it is just right for my husband and me and a little extra to share. I’ve got lots of veggies and a few flowers. I’m so happy. It has been some back breaking work and dirty work but it has been a labor of love. I’m still looking for my scarecrow. I think he must be hiding! To plant a garden is to believe in the future! 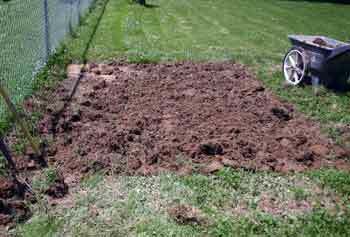 Here is the plot freshly tilled and turned. And here it is with soil amendments and mulched walking rows. Freshly planted and ready to grow! Another great way to use those yummy strawberries. Cream together butter and sugar. Add eggs and beat thoroughly. Add sifted flour and dash of salt; mix well. Spread 3/4 of the batter in oblong pan. Spread evenly. Then spread the jam; sprinkle nuts. Glob the remaining batter over top. Bake at 350 degrees for 30 minutes. Cut into squares and sprinkle with powdered sugar. I’ve had so much fun with y’all this week. I hope you have had a good time as well. 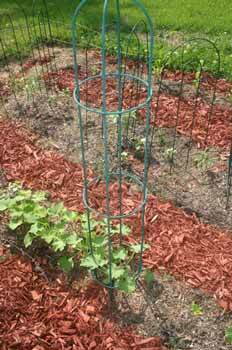 So, Frugal Friday, finds me trying to find inexpensive ways to garden. Well, yesterday, I stumbled upon the best garage sale I have ever been to. I’m not sure where the sellers got all of these plants but it was like going to a nursery right there in their yard. I got two very nice knock-out rose bushes for next to nothing. Can you believe that? They had so many nice plants, I felt like I was at Disney World (You might have to be a gardener to get that). This weekend is also time for the Master Gardener’s plant sale. 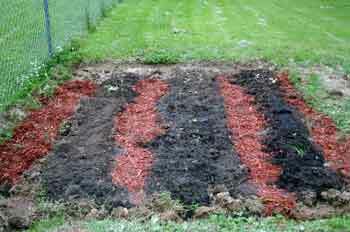 They divide up the plants in their own yards or root them or propagate them somehow and pot them up and sell them at a local park for great prices. This is one of the ways they fund their projects all around the county. I really appreciate the work they do making this area beautiful. They have gardens in front of the police station, at some of the local parks at the fairgrounds and many more places that they volunteer their time to keep up. 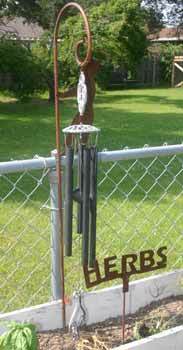 By the way, I’m still taking pics of the robin that is still busily building her nest on the drainpipe near my porch. I’ll be posting some of them sometime next week. Getting ready for the Kentucky Derby? Try this recipe for Kentucky Hot Brown Casserole. In a large casserole, layer all ingredients, except bacon and tomato in the following order. Using 1/3 of each ingredients in each layer: soup, ham, turkey, asparagus, cheese. After making all three sets of layers, top with tomato slice sand crumbled bacon. Bake at 350 degrees about 45 minutes or until bubbly. Serve over toasted English muffins or toast points. Serves 8-10. I spent my weekend outside working on the garden. I’m a little sore now but it was well worth it and nothing that a little ibuprofen won’t cure. I love spending time outdoors. Always have. When you are inside, you sometimes, forget that there is a whole other world going on outside. 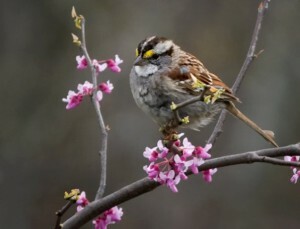 There are birds flying around, singing their songs. 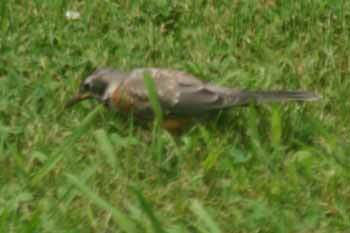 The robins loved the freshly turned ground in my garden for gathering worms. The squirrels are, as usual, trying to raid my bird feeder. There are bunny rabbits hopping around. It is a bustling, busy world out there! As I was working, the wind was blowing quite a bit. Every now and then, I would get a whiff of something sweet. Something sweet that is blooming somewhere and the wind was carrying the scent to me in my garden. 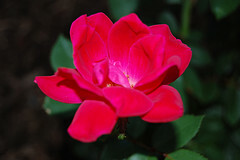 I was very thankful for the breeze to cool me off from my toiling in the soil as well as for the lovely scent of blooms. All of this puts me in mind of Louis Armstrong singing What a Beautiful World. Even with all of the turmoil in the world, all the strife and conflict, it truly is a beautiful world. You just have to stop and see it. Great as an appetizer or a side dish, this is tasty little bundle. 1/2 (8 ounce) package cream cheese, softened (try herb cream cheese or other flavors of cream cheese). Blanch asparagus spears in boiling water for 2 to 3 minutes. Submerge in ice water. Spread prosciutto slices with cream cheese. Wrap slices around 2 or 3 asparagus spears. Arrange wrapped spears in a single layer on a medium baking sheet. Bake 7 – 10 minutes in the preheated oven, until asparagus is tender. Still working on the dream garden. It must have herbs. Lots and lots. 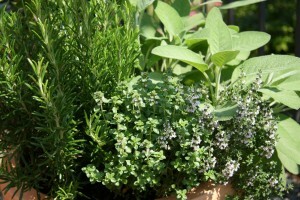 I have always loved growing herbs. 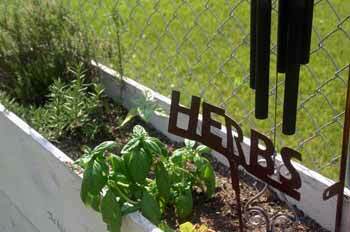 In addition to cooking with herbs, I have enjoyed growing herbs to connect to a history of herb use for all sorts of things. I searched out books on how traditionally people have used herbs for illness, cooking, good luck, bad luck and all sorts of things. It is interesting to grow things that have a story. Rosemary – It’s very name is rooted in legend. The story goes that when Joseph and Mary were fleeing Egypt, Mary draped her blue cloak on a Rosemary bush. She then laid a flower on top of the cloak. That night, the flower turned blue and, thereafter, the bush was know as the “Rose of Mary: or Rosemary. 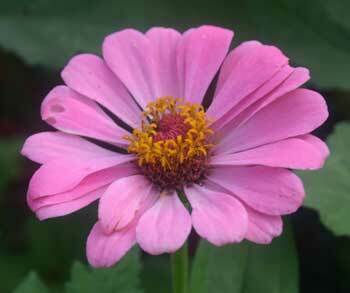 It is believed to strengthen the brain and enhance memory. 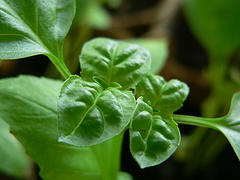 Sweet Basil – It’s name means “be fragrant,” and it is. Greeks despised it but the Romans loved it and made it a symbol of love an fertility. Today, it is planted in homes by Hindus to bring happiness to the family. Dill – It’s name is derived from the old Norse word, “dilla” meaning “to lull.” It was used to lull babies to sleep. 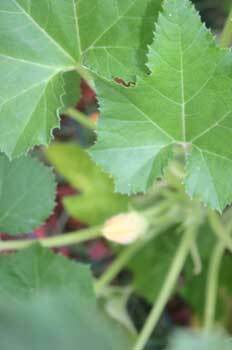 Romans used it as a stimulant for gladiators. 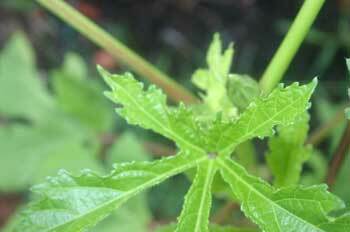 It has also been used as an antidote for witchcraft and sorcery. Garlic – It was worshiped by the Egyptians and they fed it to the the workers building the Great Pyramid at Giza, around 2600 B. C. It was eaten by Greek athletes who believed it gave them strength. It has been used to ward off evil in the form of vampires and fleas. Parsley – Medieval Europeans believed they could kill their enemies by plucking a sprig of parsley while speaking their enemy’s name. Roman put it around their necks to absorb fumes (don’t ask me what that is about). Sage – It’s name is derived from the Latin word, “salia,” meaning “to save.” In ancient times, sage was used medicinally to cure snake bites and invigorate the body and mind. It has been burned to eliminate bad odors. 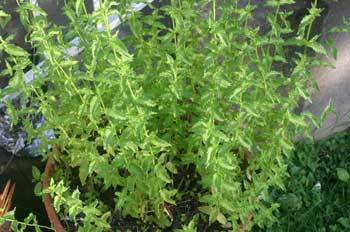 It is now used as a culinary herb. 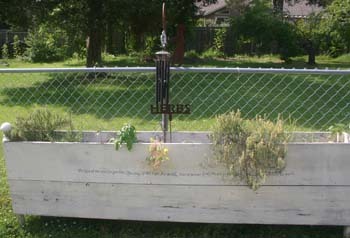 Thyme – The traditional story is that Thyme was in the straw bed of the Christ Child. Ancient Greeks considered it a symbol of sacrifice and courage. Thyme has been used to treat melancholy and to improve digestion and has even been recommended as a cure for a hangover! Growing herbs and enjoying learning about history at the same time! Who wouldn’t love that? Enjoy more of the outdoors with A Southern Daydreamer’s Outdoor Wednesdays. Traditional pate a choux pastry with herbs and cheese – Yum! 1 tablespoon each of fresh, chopped parsley, chives and dill (or whatever combination of herbs you like). In a saucepan, combine the butter, salt and one cup of water. Bring to a boil. Remove from heat and add the flour all at once. Beat well with a wooden spoon until the four is well mixed. Return the saucepan to moderate heat and cook until the dough pulls away from the sides of the pan. Remove from the heat and beat in the eggs, one at a time (a hand mixer makes this job much easier). Stir in 2/3 cups of the cheese and the herbs. Drop the pastry dough by tablespoonfuls onto a lightly greased baking sheet. Sprinkle with remaining cheese and bake for 25 to 30 minutes until puffed and golden brown. 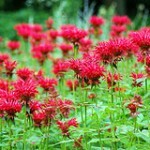 Bee Balm – I love the pretty, spiky blooms and the lemony smell. In another house where I have lived, I had bee balm that was passed to me. 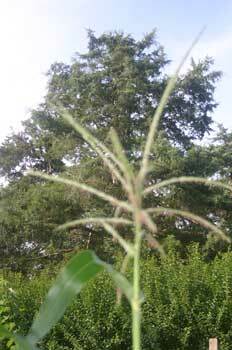 It grew prolifically and I passed it along to several of my neighbors. Black-Eyed-Susan – who doesn’t love these cheerful flowers? 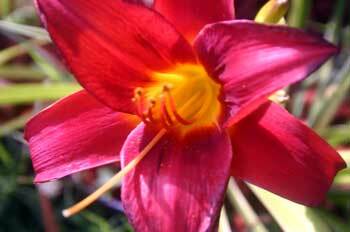 Day lilies – So many varieties and so easy to divide and so easy to grow. Irises – Like the day lily so many varieties. 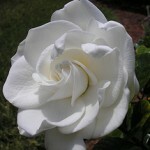 I used to have one that I loved that bloomed all summer and had a great fragrance. Blackberry lily – One of the favorite old-fashioned pass along plants. Lily of the Valley – my mom gave me some of these and I had them for years before I moved. These will take over if you are not careful. Violets – These can take over as well if you don’t watch them. But, they are so cheerful and easy to grow and fun to pass along. I had a friend in Master Gardeners who thought it was un-kind to pass along violets. If you pass these along, maybe it should be with a warning, lest someone is taken over by the pretty little plants. Coleus – I have a big pot of coleus that was given to me as cuttings. I just rooted them in water and then planted them. That was two years ago and I think they will soon be at a point that I can pass them along. Sweet Potato Vine – I got some of this with the coleus plantings and it has just done beautifully. A great pass along plant. 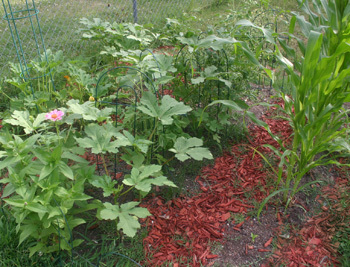 I can see this garden is coming along beautifully. What is your favorite pass along plant? In the spirit of passing things along, here is a recipe for a pass along bread starter and bread recipe. This actually takes more patience than I’ve got right now. Maybe if I made it I would develop more patience! In small bowl, soften yeast in water for about 10 minutes. Stir well. In a 2 quart glass, plastic, or ceramic container. Combine flour and sugar. Mix thoroughly or the flour will lump when milk is added. Slowly stir in warm milk and softened yeast mixture. Cover loosely and let stand at room temperature until bubbly. Refrigerate. Consider this Day 1 of a 10 day cycle. Days 2-4, stir with a spoon. Day 5, to feed, blend flour and sugar in a small bowl. Slowly mix in milk with a spoon, whisk or hand mixer. Stir mixture into starter. Return to refrigerator. Day 10, (which becomes Day 1 for the next series) feed again. NOTE: Consider the 10 day cycle a guide. It doesn’t need to be followed exactly. If you need more starter, feed it more often. The starter is yeast culture and will grow when fed. To hasten growth, leave starter at room temperature for several hours. Preheat oven to 350 degrees. Grease two 9 x 5 inch loaf pans with shortening. In a large mixer bowl, sift or thoroughly mix flour, sugar, baking powder, soda, salt, and cinnamon. Add starter, eggs, vanilla, and mix well. Stir in optional ingredients and divide batter between the prepared pans. Bake about 55 minutes (exact time will vary because of differences of optionals). Cool in pans on racks 10 minutes then turn out of pans and cool. Raisins, chopped pitted dates, nuts, dried cherries, mashed ripe bananas, blueberries, coconut, canned pumpkin, chocolate chips, chopped apples, grated carrot, grated zucchini. One of my favorite gardening books is The Southern Gardeners Book of Lists. In this book there are lists of all kinds – trees that flower, shrubs that do well in shade, perennials with a long blooming time and on and on. Gardenia – This would be a must. I love the fragrance. It is a little strong for some but it has always been one of my favorites. I get this from my mother. When I was growing up, on Mother’s Day, we always wore gardenia corsages. The florist would dye them red to signify that our mother was living. With their creamy white flowers, their dark green shiny leaves and wonderful fragrance, they definitely have a prized place in my dream garden. Hydrangea – I love their ruffly, round blooms. They always look cheerful. They bloom for a long time. The blooms dry well so you can bring them in and enjoy their beauty in the dead of winter. A Southern favorite. Forsythia – A Spring-time favorite with its beautiful yellow blooms, this one has great Fall color as well. You know Spring has arrived when the forsythia is blooming! Butterfly Bush – Colorful blooms all summer long and into the Fall, the blooms are also great for cutting. The blooms attract butterflies as well as bees (watch out!). Beautiful! Honeysuckle – Another one with a great fragrance that brings back great childhood memories. I remember as kids, we would pick the blooms and get the one little drop of the honey nectar out of little white flowers. Lovely! 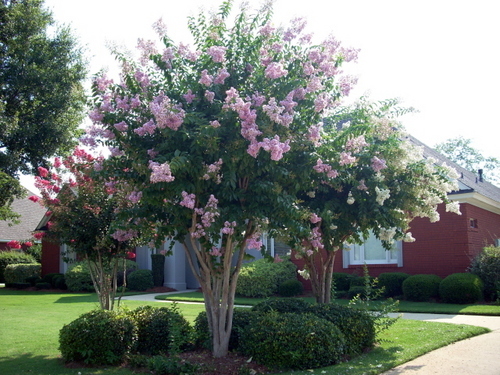 Crepe Myrtle – Sometimes these are grown as trees as well as shrubs. I love crepe myrtles because they hold up to the steamy hot heat of a Southern Summer so well. You can always depend on crepe myrtles to be blooming when it is 100 degrees outside in the shade with blooms from bright shocking pinks to cool whites. Definitely a must in my dream garden. I could go on and on but I’ll stop with these. What shrubs would be in your dream garden? Something lovely to enjoy while you are dreaming of your garden. Heat oven to 325°. Blend butter, 2 cups flour and 1/2 cup confectioners’ sugar. Pat into ungreased 13x9x2-inch pan. Bake for 18 to 20 minutes. For filling, blend together eggs, sugar, 4 tablespoons flour, lemon juice, and lemon peel. Pour over first layer. Return to oven and bake at 325° for 20 minutes. Loosen around edges, cut into bars and sift confectioners’ sugar over the top while warm.